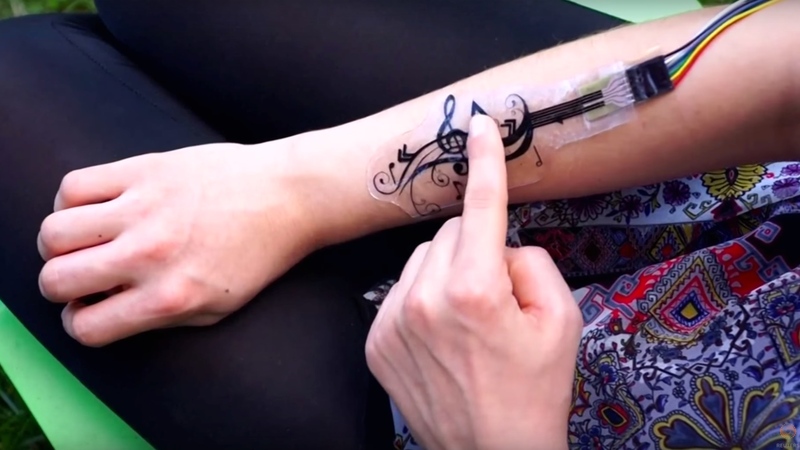 Researchers at the Max Planck Institute of Informatics in Germany have created an electronic film that uses pressure sensitive sensors and can be attached to your regular skin. iSkin uses silicon rubber and a medical grade adhesive that allows the wearer to stretch and bend it to fit on comfortably on the body as well as easily attach and remove the device. The best way to describe it is that its a kind of thin, flexible film with electronic sensors. The uses we have seen so far involve the iSkin prototype controlling smartphones - for instance, a rollout QWERTY keyboard for your forearm. The on-body wearable is wired for now. Martin Weigel, one of the developers of the iSkin, told Reuters: "Wearable electronics are mostly using rigid components which are very uncomfortable to wear on the body and are limiting the locations to, for example, the wrist or on the head. "Our sensor is a flexible and stretchable sensor so it can cover many locations, including on the back of the ear," he added. The potential for this thin, soft, flexible form factor in smart jewellery and smart clothing is absolutely huge so we'll be keeping an eye on its developments. We've seen stick-on wearables before such as AmpStrip for fitness but the original aims of this research were actually to develop a skin for use in robotics. As for the work to come, the computer science researchers at Max Planck want to make it wireless and also look into using kinetic energy from the body to power iSkin. For more details, watch the Reuters hands on YouTube video.